Brownies from Shanklin and Wroxall enjoyed an afternoon at the panto recently, with the added excitement of meeting some of the cast members during the interval. 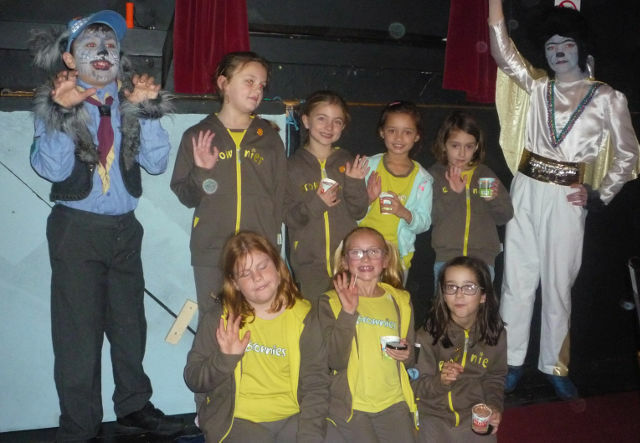 Wroxall Brownies and 4th Shanklin Brownies, units of Girlguiding IW, had a pre-Christmas treat recently when members travelled to Cowes to see the Cowes Amateur Operatic & Dramatic Society’s production of Jungle Book-The Pantomime by Cheryl Barrett. Two Brownies from Shanklin were in the production playing the parts of Wolves and Monkeys. These Girlguiding units with their leaders helped pack Trinity Theatre for the show. At the show everyone was able to join in with the usual pantomime banter and the presentation of this well-known story was quick paced and very colourful with some surprises along the way including an animal toy given to all the younger children attending. Songs included ‘Eye of the Tiger’, The Lion Sleeps Tonight’ and Funky Gibbon’. However, the Brownies most enjoyed the full of action song ‘Gone Bananas’ which is often sung at Girlguiding camp-fires. During the interval some of the Girlguiding members met with two members of the cast – Hayden as Akela and Jack as King Alvin – an added excitement for these girls. This year’s Cowes Amateur Operatic & Dramatic Society’s production of The Jungle Book-The Pantomime ran over the first weekend of December and there will be more performances on 7th, 8th and 9th of December.